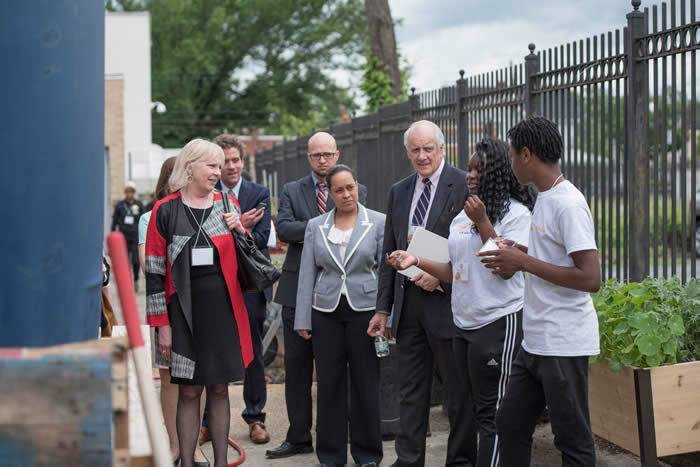 A LEARNING EXPERIENCE Department of Labor’s Gay Gilbert (far left) joins the Education Department’s acting undersecretary, James Manning (center), and deputy assistant secretary, Kim Ford, on a site tour led by ACAD students Makiya Johnson and Kyeon Ford. Following a tour of the classrooms, training labs and tiny house project at the Academy of Construction and Design (ACAD), a U.S. Department of Education official gave a nod to the career and technical education program, which he praised for its potential to be a model program. "We are looking for models in other parts of the country, and I think this is one," said James Manning, acting undersecretary at the U.S. Department of Education, during a roundtable discussion held at IDEA Public Charter School in Northeast Washington, D.C.
It’s a prospect welcomed by the D.C. Students Construction Trades Foundation, which opened the Academy’s doors in 2005 to provide District students with access to, and training in, technical specialties like carpentry and electrical. ACAD officially moved to a charter school environment in 2015. A key part of the program is businesses within the construction industry serving as training partners to teach leadership development and career and trades skills building, while mentoring students on tiny house construction and other projects. Also part of the program are sponsors and donors, like the trade organization Associated Builders and Contractors, which participated in the roundtable. In response, Manning said he would “love to see what you have” and encouraged having that conversation. PRESENTING THE VISION DCSCTF adviser Rod Woodson offers the Academy as a model program. On May 26, senior officials with the U.S. 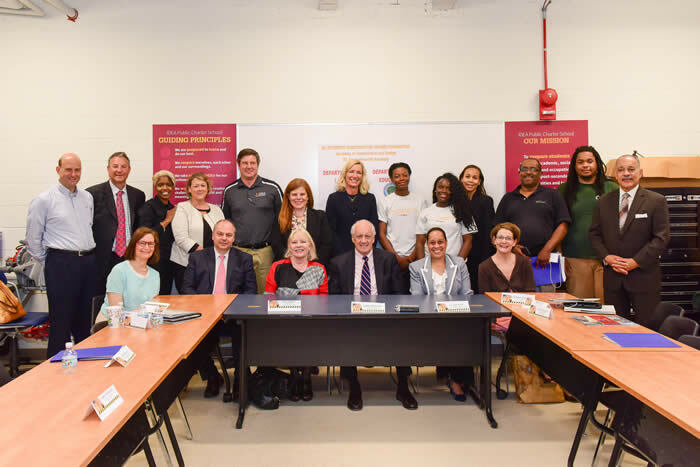 Departments of Labor and Education joined school administrators, ACAD leadership and students in a discussion of workforce development and apprenticeships, career and technical education, and alternative pathways for young people to enter the workforce or postsecondary education. 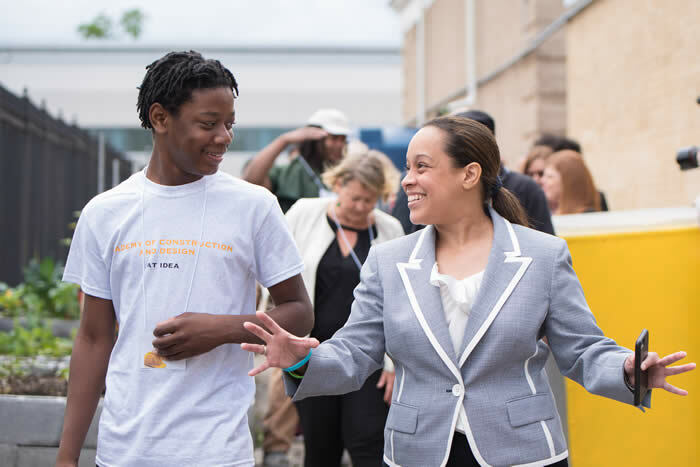 But ahead of a detailed overview of the Academy program that included presentations by current and past students, agency officials participated in a site visit of the Academy of Construction and Design. Academy students Kyeon Ford and Makiya Johnson led the tour, visiting classrooms and IDEA’s back lot, where there is a small garden of fruits and vegetables, and a greenhouse. Nearby, is the so-called Minim house, a small-scale house being built by students enrolled in ACAD construction classes. “Construction II is currently working on the Minim house, and we made cistern bases so we can water our plants for the greenhouse,” said Ford. Also on display: student-built planters and picnic tables. “The biggest takeaway is that this is one example of what the school is doing, the knowledge and skills the students are developing here and knowing they can come to high school, get a high school diploma and learn a trade, and then decide after that if a trade is what they want to continue or if they want to go off to college,” added Manning. Back inside, the roundtable continued with a dialogue about the program’s design, why such a program is important and should be supported, and a question-and-answer session. John Ladd, administrator of the Department of Labor’s Office of Apprenticeship, acknowledged that the construction industry can be a hard sell. So, he asked how the program is marketed to parents. 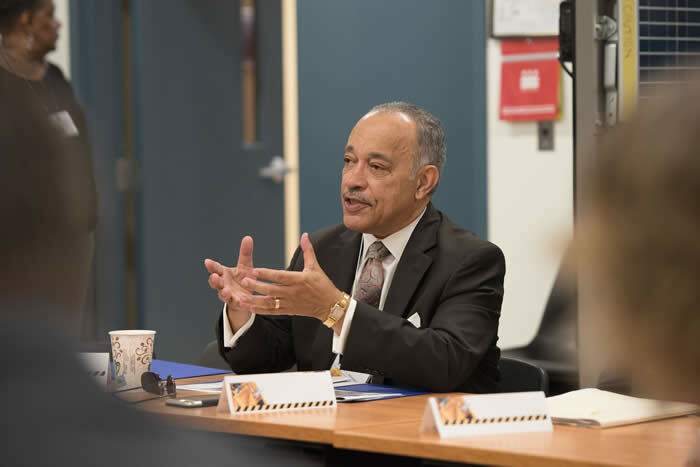 AN OFFICIAL VISITS Federal agency and local CTE officials are among leadership attending the roundtable with ACAD students, Academy stakeholders and DCSCTF members. She continued, “Some government officials still are having a hard time seeing this. We’ve had doors closed in our face a million times ... it’s like, ‘Time up.’ And then they move on.” It’s been a “long journey,” according to Woodson, but the program isn’t thwarted by challenges because both the Academy and the Foundation recognize that CTE is a “real opportunity” for the future of young people. Treymane Chatman is a graduate of the Academy, and is employed by Foundation Board member GCS Inc. He is one of the Academy’s success stories. 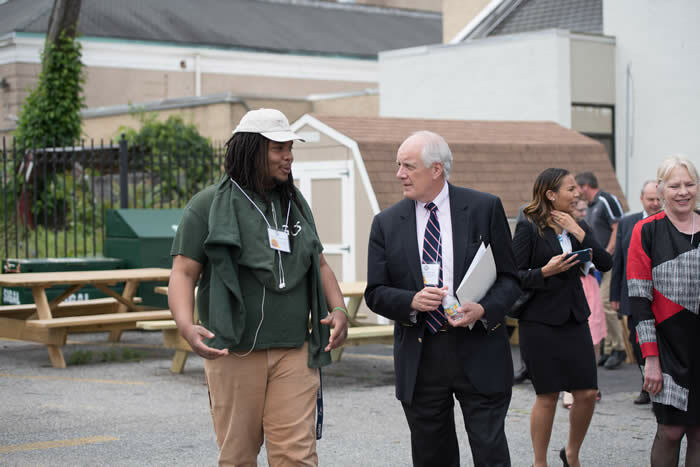 The recently certified carpenter had an opportunity to speak with Manning during the tour, sharing how ACAD prepared him for the transition from the Academy to working in the trades – three days after high school graduation. WALKING THAT WALK ACAD grad Treymane Chatman discusses his carpentry pathway. Chatman urged currently enrolled students to take advantage of all the training they are receiving in the Academy. Makiya Johnson, for one, is doing just that. The 10th grader is looking forward to enrolling in college to become a pediatrician or veterinarian. She said the program is helping fuel those goals, especially when it comes to learning networking skills that she can take with her into the real world. Meanwhile, sophomore Kyeon Ford aspires to attend MIT or University of California at Berkeley to pursue computer hardware engineering. He plans to bring his training full circle by becoming a construction company owner. ONE-ON-ONE TIME Department of Education’s Kim Ford (right) shares a moment with ACAD student Kyeon Ford (not related) after touring the urban garden..